Mobile Robots require continuous DC power supply to ensure the computers and motors continue to work when swapping batteries or when switching from DC to battery operation or when using an unreliable DC power supply backed up by battery. 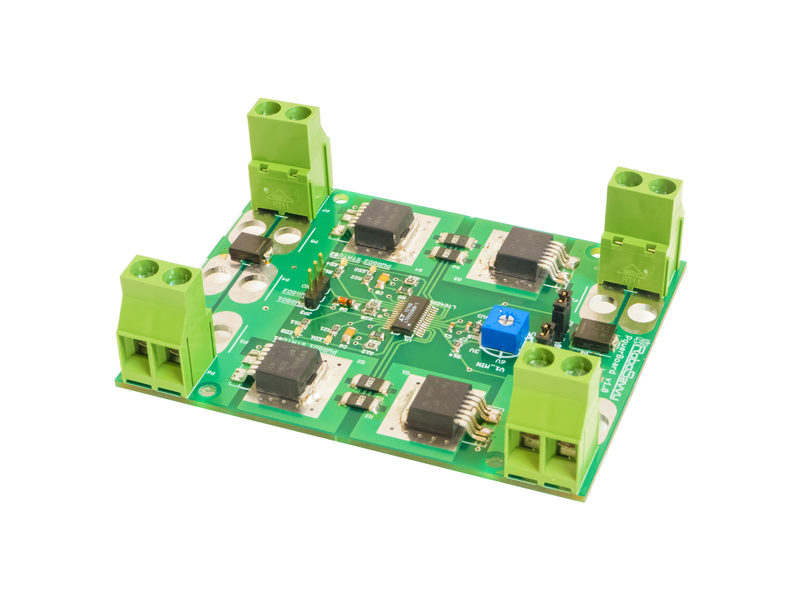 RoboSavvy HotSwap Power Board (PowerBoard 1.0) is designed to provide up to 25A of continuous power, allowing safe hot-swapping between two interchangeable power sources. 2 Input power sources (mains DC power or battery) The board can accept any combination of two power sources. They can be of different voltage within the 2.9V-18V range. Status LEDs and monitoring pins LEDS indicated current input channel source and fault. This status is available as pins to external CPU for monitoring. Wihtout terminals - user can solder the wires directly to the rails. The board has two current limiting features. When the board is initially powered, the Inrush Control feature kicks in and prevents from current spikes and sparks from occuring. When the board is working continously, the current is limited to 25A. The Output will be cut off if the current spikes between over 25A and 50A for a period exceeding 120μs. Once the Output is switched off, the board goes into Fault mode (indicated by LED3,4) and needs to be reset. If the current spikes to more than 50A during the 120μs period, it may overheat and damage the MOSFETs. 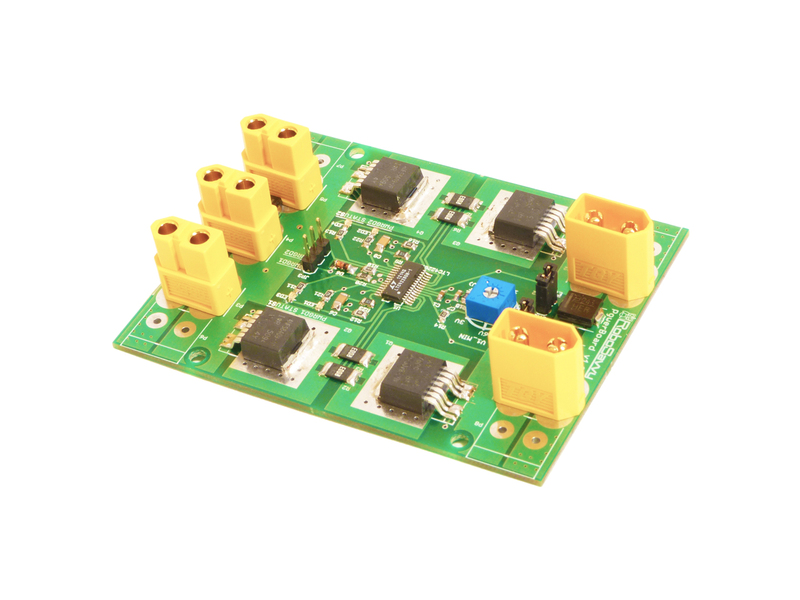 Inrush current control Limits maximum current output linearly when board is initially powered. The timing depends on input Voltage at 0.2V per millisecond. For example, 10V Input will limit current uptake during 50ms. 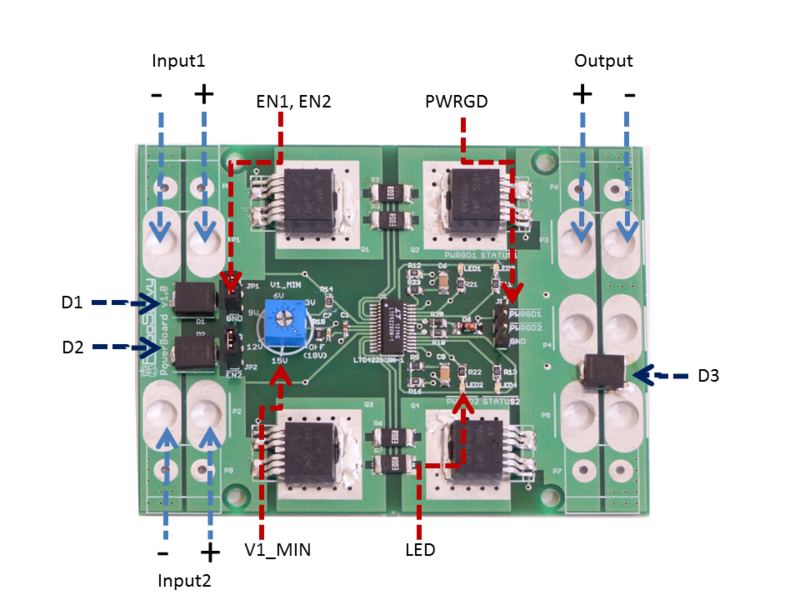 20V Input will limit the current uptake during 100ms. I > 25A, t=0 If current exceeds 25A, the clock starts ticking.. Both Input rails and the Output rail have a Transient-Voltage-Suppression (TVS) Zener diode soldered between the + and - rails (D1,D2,D3). The diode will assume all the flowing current should the voltage exceed the rated 18V-24V or should an inverted voltage be applied. Should these fault conditions happen, the board and system will be saved but the diode may be damaged as heat accumulates through prolonged exposure to the current. 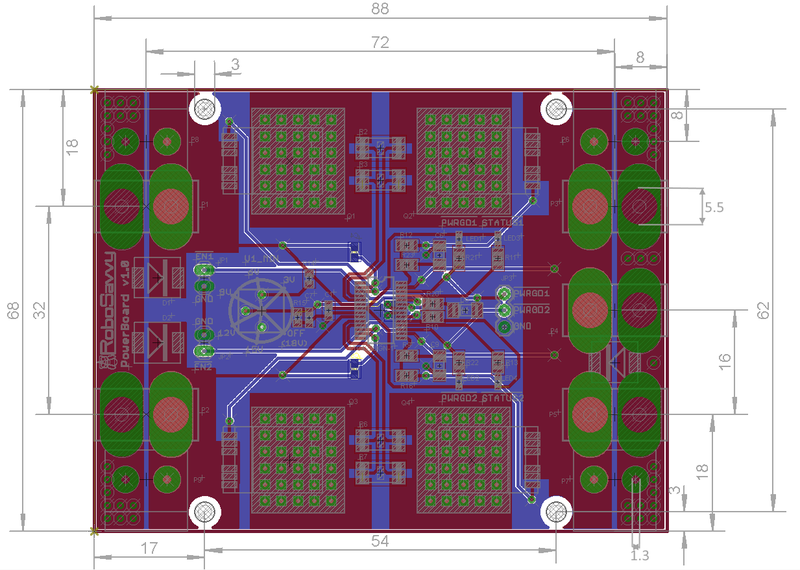 In the following two diagrams we tested the board with incandescent light bulbs, a 4-cell LiPo battery and DC power. The DC power was in Input1 and when it disconnected, the voltage resumed taking the LiPo in Input2 as source. When the light bulbs consumed 10A, the transition took 15ms and the lowest voltage resitered was 3V. When the light bulbs consumed 20A, the transition took 7ms and the lowest voltage resitered was 1.8V. Our test represents the "worst case" scenario since incandescent light-bulbs have negligeable inductance. When the target circuit has capacitance, the transition voltage drop is hardly noticeable.